Jean Joyce Schumann, age 89, of Kaukauna, passed away peacefully on November 30, 2018, at St. Paul Elder Services surrounded by her family. She was born on March 21, 1929, daughter of the late Edwin and Marian Nimmer. 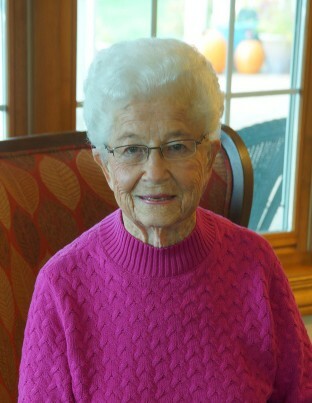 Jean worked at Kaukauna Club Cheese and the Kaukauna School System until she retired. On February 11, 1953, Jean married Albert “Junie” Schumann. Together they were on several bowling leagues. Other activities they enjoyed were camping at Berry Lake, making quilts, playing sheepshead and hosting Friday night fish fries for their family. She treasured more than anything spending time with her grandchildren as they were an important part of her life. Jean is survived by her sister, Grace Willey, daughters: Pam Droster, Janesville; Robin Schuler, Sherwood; Lori (Bruce) Meyerhofer, Menasha; grandchildren: Jamie (Andy) Murray, Adrea Allgeyer, Wyatt (Kara) Schuler, Amber (Cody) Broeren and Ben Meyerhofer; great grandchildren: Norah and Dean Murray. Jean was preceded in death by her husband of 51 years, Albert; a son, Thomas; brother, Kenneth Nimmer; brother-in-law, Orville Willey; sister-in-law, Betty Jones; grandson, Cole Schuler and a son-in-law, Wesley Droster. On Thursday, December 6, services will be held at the St. Paul Elders Services Chapel, 316 E. 14th Street, Kaukauna. Visitation will be in the chapel from 2:00-3:00pm., followed by a Mass of celebration. For online condolences, please visit www.verkuilenfh.com. The family would like to extend a special thank you to St. Paul Elder Services and St. Paul Hospice for the love and care that was given.